SCE head gasket part numbers tell you the gasket type, engine family, bore opening and thickness. First two numerals are engine family. Searching within the website or catalog by engine make will provide this information. Next two numerals are 1st & 2nd decimal places of the Bore opening. The whole number (left of the decimal place) is assumed to be known. The legend below illustrates the SCE head gasket part numbering logic. Follow the menu on the left to the head gasket listing page for your engine family (Ex: BBC Head Gaskets), then browse part numbers to the prefix type, bore and thickness. Recommended uses: High Performance Street, Mild Race, with Medium Boost or Nitrous. Note: Do not use o-rings, sealant (such as Copper Coat, SCE p/n G1612) is not required but may be used if desired. STEP 1. Before installing head gasket, visually inspect for shipment damage. Sealant beads must be continuous without gaps or scratches and the wire should not protrude out from combustion seal. STEP 2. Gasket to head check, place cylinder head on a bench flat side up. Align new gasket on head in the assembled location, check to insure 360° metal to metal contact on combustion seal paying close attention to valve reliefs, see Figures 1 & 2 below. STEP 3. Using extreme care not to gouge the sealing surface of aluminum heads, block and head mating surfaces should be scraped clean of any gasket material. Remove oil, grease, or sealant with proper cleaning solvent. STEP 4. Check head and block mating surfaces to insure flatness within .002” using a steel straight edge and thickness gauge. If a sealing surface exceeds .002” out of flat, have the component resurfaced to an 80ra finish or better. STEP 5. New head studs/bolts are recommended for proper gasket sealing. Threads must be in good condition otherwise replace, a die can be used to remove old sealant and/or rust. Use a tap to clean threads in block. If threads are tapped through the deck, use care in sealing threads to prevent coolant migration up the bolt. If studs are to be used check for proper length so nuts do not “bottom out”. Always use quality hardened washers and thread lubricant to prevent thread galling. STEP 6. The ICS Titan gasket series does not require sealant however, a light spray coat of Copper Coat (SCE p/n G1612) may be used use if extra insurance is desired. Position new gasket over locating dowels on block. Position cylinder head over dowel pins without disturbing gasket, Tighten bolts and torque in sequence per manufacturers’ specifications. STEP 7. These gaskets must be re-torqued. Start the engine and allow it to reach operating temperature without placing any load on the motor. Shut down and allow the motor to cool to ambient temperature. With the engine cold and following the recommended torque sequence, one at a time back each fastener off just enough to relieve the friction set, then re-torque to specified torque value. SAMPLE P/N T11064Recommended uses: Racing Engines with Heavy Boost or Nitrous running liquid coolant. O-rings are required in the block or head for combustion sealing, Titan head gaskets have silicone seals bonded to the gasket surfaces. However, some builders prefer to use additional sealant for street driven applications. If additional sealant is desired SCE recommends Copper Coat, SCE p/n G1612. STEP 1 - Before installing head gasket, visually inspect for shipment damage. Sealant beads must be continuous without gaps or scratches. STEP 2 - Titan series head gaskets ("T" Prefix) require o-ring combustion seals installed in the head or block (use SCE p/n 31542 o-ring kit). Great care has been taken to allow as much room as possible for o-ring placement, if your o-rings are already in the head or block check to see that the sealant beads are clear of the o-ring. STEP 3 - When installing o-rings there are two main considerations for placement. A. The o-ring must be clear of the sealant beads on the gasket. This will determine the maximum outer diameter of the o-ring. B. The O-ring diameter and location must accommodate bore opening and combustion chamber size and shape this will determine the minimum inside diameter of the o-ring. STEP 4 - Recommended o-ring protrusion is not more than 25% of gasket thickness (SEE FIGURE 1). Example: Gasket thickness .043”, O-ring protrusion height is .008” to .010”. This standard works with all thicknesses that are .050” and less. Gaskets that are thicker than .050” do not require o-ring height more than .012”. NOTE: For extreme boost or heavy nitrous an O-ring-Receiver-Groove arrangement is recommended (SEE FIGURE 3). 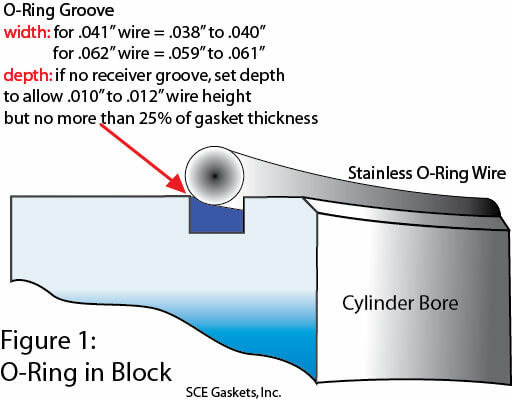 When using a receiver-groove the wire may be higher than 25% of gasket thickness; wire height & width determines receiver groove depth & width by maintaining the relationships in the Figure 3 illustration. STEP 5 - If the combustion chamber or bore is so large that the o-rings will be placed less than .100” apart between cylinders, it is advisable to use a “figure 8” pattern for o-rings (SEE FIGURE 2 BELOW). This allows for more even clamp load over the entire head surface for proper coolant sealing. STEP 6 - New head studs/bolts are recommended for proper gasket sealing. Threads must be in good condition otherwise replace, a die can be used to remove old sealant and/or rust. Use a tap to clean threads in block. If threads are tapped through the deck, use care in sealing threads to prevent coolant migration up the bolt, silicone sealer should not be used on head bolts as it will shear and leak upon re-torque. If studs are to be used check for proper length so nuts do not “bottom out”. Always use quality hardened washers and thread lubricant to prevent thread galling. STEP 7 - As with any performance application it is strongly recommended that head bolts/studs be re-torqued. Start the engine and allow it to reach operating temperature without placing any load on the motor. Shut down and allow the motor to cool to ambient temperature. With the engine cold and following the recommended torque sequence, one at a time back each fastener off just enough to relieve the friction set, then re-torque to specified torque value. Here you'll find current instruction sheets for SCE products, click on the links below for products of interest. Depending on your computer & software, you may view or print the sheet. To return to the site use the 'back' arrow. SCE EMBOSSED COPPER EXHAUST GASKETS out perform other gaskets because the sealing beads conform to header or manifold sealing surfaces. 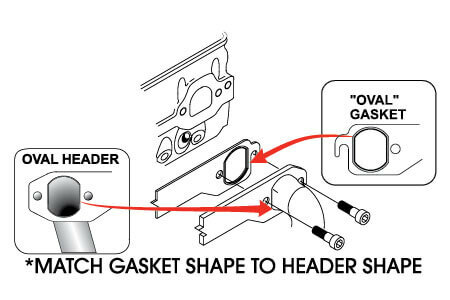 However, mis-matched gaskets (such as a D-port gasket on an oval header) will cause leaks because the embossment is not in complete contact with the raised weld bead of the header. Pro Copper exhaust gaskets will provide years of leak free performance if these simple steps are followed. Step 1 - Determine the shape & size of the header or manifold opening.It is important to note that the shape of the cylinder head exhaust port is of secondary concern. Step 2 - Select the SCE Pro Copper exhaust gasket which most closely matches the shape and size of the header or manifold opening. Insure that the embossed sealing bead will rest on the raised weld bead of the header sealing surface when assembled. Step 3 - Clean and lubricate the threads in the cylinder head so full clamping is achieved when bolts are torqued. Once the gasket is fully seated the bolts will not loosen because the gasket is solid metal and will not shrink from repeated heat cycling. Step 4 - Install gaskets and torque to specification. Proper torque for new lubricated 3/8” x 16 grade 5 bolts is between 25 and 30 foot pounds. Extreme heat applications such as towing may cause the gaskets to relax slightly as indicated by a “ticking” sound at idle. Do not discard the gasket; simply re-torque the bolts, 1 re-torque is usually sufficient for permanent sealing. Recommended uses:Extreme Boost, Nitrous, Blown Alcohol or Nitromethane. For best results SCE Pro Copper Head Gaskets should be used with O-rings in the block or head and sealant if liquid cooled (use Copper Coat, SCE p/n G1612). STEP 1 - Before installing the gasket perform a visual check to insure that no damage occurred during shipping. The gaskets should be flat and free of dents or scratches. STEP 2 - All SCE copper head gaskets are annealed in a vacuum oven after the punching process to provide malleable gaskets which are ready to use, do not use a torch to soften the gaskets. STEP 3 - Pro Copper series head gaskets (P prefix) require the use of a sealant for coolant and oil passages and o-ring combustion seals installed in the head or block. (P/N 31542 o-ring kit). STEP 4 - If you are installing o-rings make sure that the o-ring diameter and location accommodates both bore opening and combustion chamber shape. This will determine the minimum inside diameter of the o-ring. 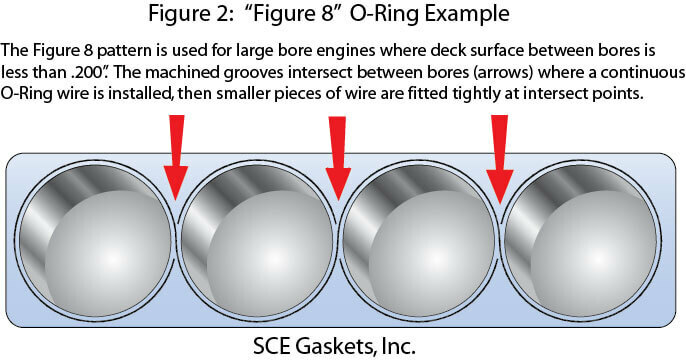 STEP 5 - If the combustion chamber or bore is so large that o-rings must be placed less than .100” apart between cylinders, it is advisable to use a “figure 8” pattern for o-rings (see figure #2). This allows for more even clamp load over the entire head surface. 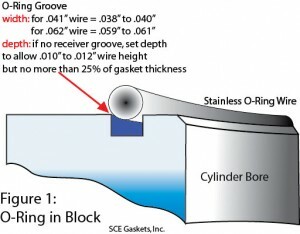 STEP 6 - Recommended o-ring protrusion is not more than 25% of gasket thickness (see figure 1 below). Wire height in excess of 25% gasket thickness without receiver grooves may cause coolant leaks by supporting the cylinder head too high for proper coolant sealing. Example: Gasket thickness .043”, o-ring protrusion height should be .008” to .010”. This standard works with all thicknesses that are .050” and less. Gaskets thicker than .050” do not require o-ring height more than .012”. Note: For extreme boost or heavy Nitrous an O-ring-Receiver-Groove arrangement is recommended (see figure 3 below). 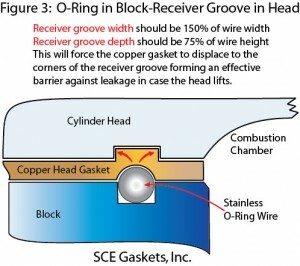 When using an O-Ring / Receiver Groove setup the wire may be higher than 25% of gasket thickness because the gasket will displace into the groove. Wire height & width determines receiver groove depth & width by maintaining the relationships in the figure 3 illustration. STEP 7 - New head studs/bolts are recommended for proper gasket sealing. Threads must be in good condition otherwise replace, a die can be used to remove old sealant and/or rust. Use a tap to clean threads in block. If threads are tapped through the deck, use a proper thread sealant (SCE p/n G1615) to prevent coolant migration up the bolt, silicone sealer is not suitable for thread sealant on bolts as it will shear and leak when heads are re-torqued. If studs are to be used check for proper length so nuts do not “bottom out”. Always use quality hardened washers and thread lubricant to prevent thread galling. STEP 7 - As with any performance application it is strongly recommended that head bolts/studs be re-torqued. Start the engine and allow it to reach operating temperature without placing any load on the motor. Shut down and allow the motor to cool to ambient temperature (over-night). With the engine cold and following the recommended torque sequence, one at a time back each fastener off just enough to relieve the friction set, then re-torque to specified torque value. A single wire o-ring between the cylinders allows the head to settle properly on the outlying areas of the block for coolant sealing. Two wires in a very tight area cause the copper gasket to 'stack-up' creating a very tight combustion seal but it causes coolant leaks and may warp the head. ▶ Given the Choices.. Why would one use a copper head gasket? As published in AERA Magazine by Ryan Hunter, President, SCE Gaskets, Inc.
Let's dig into it because there are applications (perhaps more than you think) for which copper head gaskets are the best choice. To be sure, copper has been around for a while and with good reason. Let's walk through some of the attributes and benefits unique to copper, then we'll get ready to put them on. Malleable: Copper is stronger than any composite head gasket yet still malleable so it conforms to the sealing surfaces. This strength-malleability combination is, more than any other attribute, the ‘selling point’ of copper as a head gasket material over other materials. While the advantages of strength are self evident, the benefits of a malleable gasket body are somewhat more nuanced. Simply put; conformity makes a tighter seal which will show up in lower leak down percentages. Metal-to-Metal: To an engine builder, the words “High Performance” pre-suppose high pressure, high pressure requires a more robust combustion seal and the best combustion seal is metal-to-metal. I'll elaborate; many cylinder head gaskets are coated with sealants designed to eliminate fluid leaks. From experience, readers of this article will be familiar with the various types from slick to sticky and while these work well for fluid sealing they are not able to withstand combustion pressure and heat. No matter how good an elastomeric coating may be for coolant or oil, it will eventually scrub off, burn off, or blow off the fire ring area of the head gasket and in performance engines this can happen in a surprisingly short period of time. Once the sealant is gone from the fire ring combustion seal it's a short trip to the nearest coolant passage. Silicone, or other rubber-like sealants or coatings should never be placed on the combustion seal in performance engines. Options: Copper comes in a wide range of thickness choices; (from .021” to .093” in roughly ten thousandths increments) providing the options necessary to optimize piston to valve, piston to head and in wedge combustion chambers, piston to quench area. Conductivity: Copper is the standard for conductors, in head gaskets we don't care about electricity but we do deal with heat. Superior conductivity benefits performance and racing engine builders in two primary ways: A. block & head temperatures are more even. B. Combustion chamber hot spots are dissipated quickly. Cylinder block/head temperature parity is an aid to tuning, though frankly, it's a minimal factor until you reach the narrow end of the tuning window. The big advantage of conductivity is in the combustion chamber area. In and around the combustion chamber standard composite head gaskets and MLS head gaskets are somewhat insulated from the cylinder head and block by the facings and coatings respectively. Heat related failures occur more often with composite and MLS head gaskets than with copper because the heat is trapped within the gasket body allowing hot spots to intensify, whereas the copper being both a better conductor and having direct contact with the block and head (remember metal-to-metal) transfers the heat to the heat exchanger, aka the cooling system, through the head and block. Elasticity: Another interesting feature of copper, this benefit comes into play when you're out of the tuning window far enough to actually damage the head gasket. Un-alloyed or pure copper has a 25% coefficient of elasticity; cool term, here's what it means. In a 4 inch section, the copper head gasket will stretch to 5 inches before it ruptures. This gives the user a ‘safety factor’ not available with other head gasket materials. Blown, nitrous or turbocharged engines can develop cylinder pressures high enough to lift the cylinder head or push the gasket. A typical bad-actor in this regard is the small block Ford; get some good cylinder heads, add some boost or nitrous, she's goin' fast but Daddy wants more and.. the head gasket is peekin' out between the bolts. If this happens with copper the damage is apparent but the head gasket hasn't yet failed. The safety factor of elasticity allowed the copper gasket to push but still remain intact so you can either back it down & make the next round or back it down & drive home. If you push a composite gasket, game over. Do Copper Head Gaskets Require Different Torque Values?Generally No. Fastener torque values are determined in relationship with the cylinder head and block structure. Arbitrarily increasing torque values will distort the block or head. However, there are good cases for fine tuning the torque values based upon how the head gaskets look after the first use. A nice thing about copper head gaskets is that you can ‘read’ them very easily once you know what to look for and, what to look for is evenly distributed clamp load. No gasket works in isolation, all gaskets require clamp load to do what they do and copper gaskets tell you where the clamp load is light by keeping their shine. Specifically, you want to see machining marks from the block & head surfaces transferred to the copper gasket body everywhere on the gasket. Places where the original finish of the gasket remains need some attention. Keep in mind there may be other factors in play such as, a ring dowel counterbore that has become too shallow from surfacing or a head nut bottoming on the threads of a head stud. Once you have eliminated any mechanical obstruction preventing the head from seating properly you can safely increase torque values in the light load areas by 5 to 10 ft lbs. What about re-torquing? Solid copper (like a liquid) does not compress, it displaces. Since the copper gasket body does not compress no re-torque is technically necessary. However, since the engine build using a copper head gasket is almost always within the realm of performance or racing, I always recommend one re-torque of the head bolts after a complete heat cycle. Block & Head Preparation for Copper Head Gaskets:Cleanliness is next to..You might be surprised at some of the samples we've received from customers asking “why did it fail?” Then again if you've been around for a while, you may not be surprised at all. I have seen head gaskets with sawdust, sand and actual small rocks embedded in them, as well as the remains of facing material from the previous head gasket. The aircraft industry has an acronym that's suitable here; FOD, Foreign Object Damage. Like leaving a wrench in the lifter valley, rocks in the combustion seal are not ok, chaos will ensue. So, as Momma taught us: let's be clean when we're doin' our duty. Use a residue-free solvent such as aerosol brake cleaner and a clean rag on the head and block sealing surfaces before assembly. Flat: Of course the block & head should be flat within .002” across and .004” lengthwise, with surface finish of 60 to 80RA preferred, 60 to 100RA acceptable. 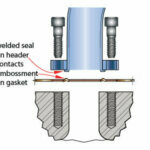 Combustion Sealing: Head gasket sealing is a matter of balance and more pressure is needed on the combustion seal than other areas of the gasket, this is due to the vast difference in pressures acting against the head gasket. Consider that an engine developing 1.5 to 2 horsepower per cubic inch will have between 1000 and 1200 psi in the combustion chamber while, less than 1/2” away, the cooling system is running at 22psi max. Since a standard copper gasket is flat, clamp load from the tightened head bolts will be distributed evenly unless some method is used to ‘tip the balance’ and concentrate the proper load on the combustion sealing area. When using flat copper head gaskets, the accepted method has been to install O-rings in the block or head sealing surface around the bore or chamber respectively, to accept an o-ring. What's an o-ring you ask? Simpler than you think, it's just a piece of wire tapped into a groove that sticks out enough to pinch the copper gasket. Well, maybe that's an over simplification but all you have to know from there are the proper dimensions of the O-ring groove. Sealants Required? Yes, some method of sealing is required if the engine will be running coolant or oil through the head gasket. I state it this way because many racing specific engines either A. do not run coolant or B. re-route the coolant and oil away from the head/block mating surfaces. Since most engines run coolant and oil through the head gaskets we'll discuss head gasket sealants. Most importantly, you don't need very much; second, don’t use silicone.. that about covers it. People get into trouble with leaking head gaskets when they use too much sealant, especially too much silicone. Since the block and head surfaces are flat, the potential leak paths are very small, even with a 100RA surface finish the peaks and valleys are only about .002”, which doesn't require very much sealant to be fluid-tight. Head gasket dressings do not cure, therefore, as the head bolts are tightened the sealant ‘flows’ from the places it's not needed (peaks) but remains in place to seal the leak paths (valleys). By contrast, silicone cures to form a layer that the cylinder head can sit on, never actually coming into contact with the head gasket (refer back to our discussion about metal-to-metal above). We recommend and use both KW Copper Coat and Hylomar in the aerosol cans, simply spray a light coat on both sides of the gasket, let it ‘tack up’ for a while (no less than 2 hours) and you’re ready to bolt the heads on. We could go into much more detail about each of these items if this was a technical manual but my hope is that this information will be of help to you when the need arises, or you need some options that are not available from conventional head gaskets. SCE Gaskets manufactures a complete line of racing and performance gaskets including standard flat copper head gaskets of the type discussed here.Â As well, we offer our patented self sealing (no sealant required) copper head gaskets for use with O-rings and self sealing copper head gaskets with Integral Combustion Seal O-rings (no machining required). We also have a complete line of replacement gaskets for passenger cars, light trucks, vintage and tractor engines marketed under our Engine Master brand. Solid copper construction, pre heat-treated. Requires additional sealant for coolant (if liquid cooled) and oil passages . Requires o-rings in block or heads for combustion sealing. Solid copper construction with coolant and oil seals, pre heat-treated. No additional sealant required for coolant and oil passages. Heat-treated copper body with coolant, oil and combustion seals built in. No o-rings required for combustion sealing. Race Pages: What are the differences between head gasket materials, and how do you pick which type is right for a particular application? SCE: There are two major groups of head gasket construction (Composite & Metal) with a few sub-sets in each. A. Thin gasket sheeting bonded to a steel core with a fire ring at the cylinder bore and various kinds of coatings to seal fluids. B. Perforated metal with a compressible core such as flexible graphite again with a coating for sealing and a fire ring around the bores. C. Perforated metal core with facing material such as flexible graphite mechanically “clinched” to the core and fire rings around the bores. There are some variations in the construction and materials but those are the major differences. Composite gaskets are “user friendly” in that they require no additional sealants and are capable of sealing less than perfect surfaces due to the overall compressibility and capillary sealing qualities of the facing materials. At SCE we manufacture composite head gaskets using B. & C. methods of construction for their simplicity, strength and resistance to heat. A. Shim steel, the oldest of the pure metal gaskets is simply a thin (.015” to .020”) stamping of special alloy Tin plated steel that is embossed around the openings to achieve load differential. These gaskets require use of a sealant, these single layer steel head gaskets are coated with a special silver paint & the tiny flecks of aluminum aid in fluid sealing. B. Multi layer steel or MLS, this relatively new method of construction consists of two or more embossed stainless sheets riveted to a flat metal core. This method offers some advantages over the shim steel, they are available in different thicknesses so the builder can adjust compression height, and they require no additional sealant due to a micro thin layer of nitrile rubber or flouroelastomer sealant applied to the facings. Due to the hardness of stainless steel MLS gaskets require a very smooth finish surface or leaks may result. C. Solid copper is capable of sealing more combustion pressure than the other two metal head gaskets, when used with an o-ring-receiver-groove these gaskets control the explosive force of Top Fuel engines exceeding 15,000psi in the combustion chamber which compares to approximately 2000psi in a naturally aspirated Pro Stock engine. Copper gaskets offer the most options to the engine builder for bore & thickness combinations and the material is malleable allowing it to conform well. Coolant leaks typically associated with copper gaskets are no longer an issue. The new SCE TITAN head gasket is the world's first self sealing copper head gasket offering the racer the best of both worlds, ultimate strength and built in fluid sealing for leak proof performance. Race Pages: When you're talking about head gaskets, is there such a thing as "too much" gasket for a particular use, or is it mostly cost issues that keep everyone from running a high-performance O-ring setup? SCE: In my opinion you can’t be too safe. The choice of head gasket may be the only limiting factor to performance when good components are used throughout the rest of the engine. If the customer does not intend to better the performance of the car by adding or increasing nitrous, a blower, or turbo charging then a good composite head gasket is sufficient. However, in my experience the nature of our customer is to push the envelope. Race Pages: What's available in the way of exhaust gaskets, and why would you pick, say, a copper gasket over a conventional material? SCE: This and other industries are still suffering the effects of trial lawyers and asbestos so no company big enough to be a target will touch the stuff. Because of that there are now several good non-asbestos alternatives the best being metal reinforced graphite which is what we offer for our upscale composition gasket. Copper exhaust gaskets work well simply because of the properties of the metal, copper conforms to the surfaces being sealed and there are no binders to cook out so the gasket will not shrink from heat cycling and blow out. Copper is also a great heat conductor so an added benefit is that the flange stays the same temperature as the head resulting in less warpage. Race Pages: Sealant or no sealant: Which gaskets need goo applied to them to work properly, and why? Also, which sealants do you recommend for the gaskets that need them? SCE: As I mentioned above, our Self Sealing TITAN and ICS Titan copper head gaskets require no goo, they have precision seals tightly bonded to both sides of the gasket around each coolant and oil passage. The seals are staggered top & bottom rather than stacked, allowing the soft copper to conform around the seal as the head is torqued forming a containment trough which locks it in place somewhat like an o-ring groove. This patented design allows the gasket to have metal to metal contact at the o-ring which is critical to sealing the combustion pressures associated with racing. Conventional Pro Copper head gaskets require additional sealant when the engine in question is running coolant. Many people have used silicone however SCE does not recommend using silicone for cylinder head sealing. You don't want the head “riding” on a layer of cured silicone; it won't begin to seal combustion pressure. We recommend a light coat of anaerobic sealer designed for the purpose Copper Coat (SCE p/n G1612) or Aero-Grade Hylomar. These sealants remain pliable rather than curing so it will 'flow' out of where it's not needed and stay where it needs to be. Races Pages: Any other question you get asked a lot that you'd like to pass along? 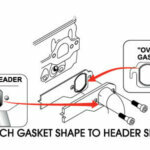 Head Gasket considerations when adding Nitrous Oxide to an engine. An item too often overlooked in planning for the addition of power enhancers such as Nitrous Oxide is the cylinder head gaskets that actually seal the resultant higher combustion pressure. 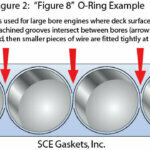 SCE Gaskets offers three “stages” of performance head gaskets for use in Nitrous applications. Stage 1; SCE Pro Seal composite head gaskets. These gaskets utilize a high density flexible graphite body mechanically “clinched” to a steel core, then wrapped with 321 stainless fire ring armor. This combination of base materials and methods of manufacture provide a gasket that is strong enough to seal a 150 to 200HP shot of nitrous while offering unsurpassed protection against heat damage. Stage 2; ICS Titan self sealing copper head gaskets. These unique, patented head gaskets feature precision bonded sealing beads on the head gasket surfaces for built-in coolant sealing plus, an Integral-Combustion-Seal consisting of a stainless wire inserted into the gasket body around the combustion chamber. Stage 3; SCE Pro Copper solid copper head gaskets. These are the bad boys of drag racing. When used in conjunction with a stainless steel o-ring and receiver groove SCE Copper gaskets will seal the biggest multi stage nitrous system you can fit between the fenders. Also, SCE offers the worlds first self sealing copper head gaskets with precision sealing beads bonded to the copper head gasket surfaces top & bottom. The SCE TITAN self sealing copper head gasket not only seals off-the-scale combustion pressure, it also assures leak-free coolant and oil sealing. So you see, there are products to make your street driven bottle rocket as dependable as it is quick. It just requires a little planning. When using a copper head gasket, do I have to O-Ring my motor? The ICS Titan series ("S" Prefix part numbers) do not require separate O-rings in the block or cylinder head. Titan ("T" Prefix part numbers) and Pro Copper ("P" Prefix part numbers) require an O-Ring in the block or head (SCE part # 31542). Can I install an O-Ring the head or must it be in the block? The o-ring seals equally well in either the block or head. If using aluminum cylinder heads it is preferable to place the O-ring in the head, this will prevent damage to the soft aluminum head surface from 'friction brinneling'. Are there any recommendations on how to O-Ring an engine? Detailed, printable instructions are available on this site under Tech FAQ's > Printable Instruction Sheets. Are copper head gaskets reusable? Yes, they can be reused several times as long as there are no signs of combustion leakage past the O-ring-combustion seal. Leakage will be evidenced by carbon tracking (shadowing) beyond the combustion seal. When installing embossed copper exhaust gaskets, which side goes toward the head? The flat side of the embossed copper exhaust gasket faces the head. The embossed (raised) sealing ring faces the manifold or header and conforms to irregularities in the sealing surface of either. Are copper exhaust products reusable? Yes, Copper exhaust gaskets can be reused several times as long as they are re-installed on the same flange from which they came. Do you recommend a re-torque on head gaskets? All racing and performance head gaskets should be re-torqued. Since many of our customers operate in the extreme conditions of Racing and High Performance, SCE recommends a re-torque in these applications. Does SCE have a high performance head gasket other than copper? Yes, we manufacture Performance Composite head gaskets and Embossed Steel Shim head gaskets designed specifically for street/strip or naturally aspirated racing engines. WHEN IS A PERFORMANCE HEAD GASKET NECESSARY? Whenever cylinder pressure is substantially increased, usually as a result of performance enhancing modifications. Over 8 pounds boost, or over 150hp of nitrous oxide. WHAT TYPE OF HEAD GASKET IS RECOMENDED. It depends on the components in the engine and the intended use. Please see the "Compression Limitations" page on this site. SCE manufactures the full range of performance head gaskets, from our Pro-Seal composite for moderate performance increases such as Street blowers or 150hp nitrous kits, all the way to our Pro-Copper head gaskets which provide superior sealing in extreme conditions. REASONS FOR CHOOSING A COPPER HEAD GASKET. Extreme performance enhancing modifications, exotic racing fuels; 16:1 and higher compression ratios, high levels of boost, or nitrous kits exceeding 200hp. Piston to head clearance adjustments. If for example, @ TDC, the piston and rod assembly is too close to the head, a thicker head gasket can restore the proper clearances. SCE copper head gaskets are available in 12 thicknesses up to .110”. Compression ratio adjustments can be made by using thicker or thinner gaskets. However, reason must be used when adjusting compression ratios with gasket thickness, as every .010” change in thickness will net a change in volume of about 2.5cc. This method will never raise an 8.5:1 street engine to a 12.5:1 race engine but small adjustments are possible. Conductivity. Copper is the standard by which all other conductors are measured, therefore a copper gasket provides superior thermal conductivity, acting to stabilize head and block temperatures which makes tuning easier. 25% coefficient of elasticity. One of the properties of copper is that it stretches before a catastrophic failure, thereby providing an extra measure of safety in case of severe detonation. Strength. Copper (in the form we use) has a tensile strength of approximately 32,000 psi, compare this to the 1,200 to 1,800psi tensile strength of most facing materials used on conventional performance head gaskets. Clean flat surfaces are essential to seal any performance engine. A solvent such as brake cleaner should be used on the block and head prior to assembly. The ICS Titan head gasket series does not require O-rings. However, for high output racing applications O-rings (and receiver grooves for the most extreme engines) are generally required to maintain combustion sealing even when the cylinder head lifts. SCE sells stainless steel O-ring wire in a kit (SCE p/n 31542) to do one V-8 engine or 1lb spools for the engine builder. 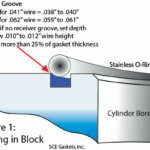 SCE stainless steel O-ring wire is preferred over copper wire that can flatten or dent to form a leak path. O-ring grooves may be cut in either the block or cylinder head. When using aluminum cylinder heads it is preferable to place the O-ring in the cylinder head. This will prevent the softer aluminum head surface from being damaged by friction brinneling. When using copper head gaskets thinner than .050”, O-ring height should be no more than 25% of gasket thickness. For instance, the proper dimensions for an .043” thick gasket using .041” wire would be; a .038” to .040” groove width (provides a .001” interference fit), and a .032” groove depth (leaves .008”-.010” of the wire protruding above the deck). This machining can be done at most high performance machine shops. 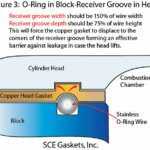 Please see the Printable Instruction Sheet for SCE Pro Copper Head Gaskets and Titan series head gaskets on this site. When receiver grooves are necessary, alignment of O-ring and receiver groove is critical, as is the depth and width of the receiver groove. Generally receiver groove depth should be 75% of the O-ring protrusion and the receiver groove should be 1.5 times the wire width. Example: If the O-ring is .041” wide and .015” above the deck; receiver groove should be .012” deep and .060” wide. While the machining of O-ring and receiver grooves must be done by a machinist, the installation of the O-ring wire can be done by anyone, using common hand tools. When tapping O-ring wire into the groove, use care to avoid denting the wire. SCE provides an O-ring installation kit, (SCE PART #31542) which includes instructions, an installation tool and O-ring wire. When cutting stainless O-ring wire, file the ends square to provide the tightest possible seal. In all racing and performance engines, head gaskets should be re-torqued after initial run-in regardless of type, solid copper, steel or composition. SCE recommends using factory torque specs. Do not over torque. Allow the heads and block to cool for accurate torque readings. Always use a torque wrench and have it calibrated often. Premium grade head bolts or studs, with hardened washers are recommended. SCE copper gaskets can be reused 4 to 5 times simply by cleaning in common solvent. DO NOT use a torch or household oven to “re-anneal” copper gaskets. The annealing process requires special vacuum ovens to achieve satisfactory results. These installation tips may seem like a lot of information for head gaskets, however, installing a copper head gasket and O-ring system is really easier than degreeing a cam, and just as important. As we know, Copper is an excellent conductor of heat, in fact it is the standard by which all conductors are measured. Superior conductivity gives the racer the ability to tune better because the head & block are a more even temperature than in the case of either a composite gasket or an MLS gasket which, though it is metal, has a coating of sealant (.001” Viton) that acts as an insulator. Copper has other properties that make it a very suitable choice for head gasket sealing, the tensile strength of copper in the alloy we use is approximately 32,000psi, compared to a tensile strength of 1250psi in the facing material of conventional composite head gaskets. Copper has a 25% coefficient of elasticity; this allows a copper gasket to stretch considerably before failing. This beneficial property has permitted many SCE customers to finish a race event, only to find upon servicing the engine thereafter that the head gaskets had ”pushed” but not failed, the copper body gasket allowed them to finish the event and pointed them to a tuning issue as well. MLS gaskets require sealing surface finishes much finer than the ICS or a conventional composite head gasket. Fel-Pro recommends 15 to 30 Ra surface finish for their MLS gaskets, to give you a visual, crankshaft journals are finished to about a 12Ra, so, for proper installation of an MLS head gasket you will see your reflection in the sealing surfaces. One reason MLS gaskets require such smooth surfaces is that the gasket layers are made of stainless steel, which is harder than either the block or head, thus the gasket will not conform to irregularities. Further, the sealant coating is only .001” thick which is not sufficient to seal leak paths under the gasket formed by standard head surfacing of 60Ra. Ra stands for roughness average and it is measured in microns or “millionths of a meter”, a surface finish with a roughness average of 60 will have peaks and valleys of .002362” whereas the much finer surface finishes of 15 to 30 Ra will have peaks and valleys of .000590” and .001181” respectively. As one can see from these figures, MLS gaskets would leak fluids on a standard “out of the box” cylinder head surface finish of 60Ra. In addition the normal surface finish will quickly abrade or “scuff” the black fluoroelastomer (Viton) sealant coating on the MLS gasket exacerbating the fluid leak problem. Many machine shops do not have the equipment necessary to produce the surface finish required for MLS head gaskets; the venerable Storm-Vulcan requires a retrofit feed which slows the travel to produce these finishes. Bottom line; ICS requires no special surface finishes, rather, those found on new parts out of the box or easily produced by standard equipment are well within the preferred range, the ICS is easier to use. The patented combustion seal in the ICS is a “two stage” dynamic seal; the first stage of sealing is due to load concentration from the wire inserted into the gasket around the bore. This has much the same effect as installing an o-ring in the block or head, it simply creates a load differential under the tightening head bolts. 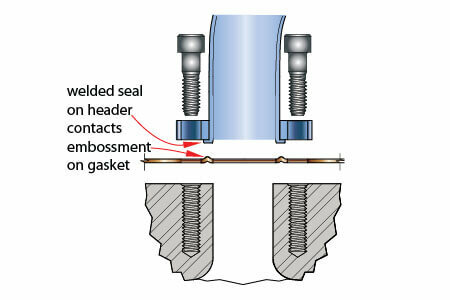 Secondly, the upper & lower flanges of the ICS remain open to combustion pressure to form a gas seal upon which high pressure gases are allowed to act against the opposing flanges of the seal forcing the flanges to remain in contact with the sealing surfaces as shown in the center diagram below. This action of the ICS seal was proven in our initial testing and in subsequent engine builds where extreme combustion pressure (over 3000psi) has been achieved. The ICS head gasket has been proven to outperform the competitors’ gaskets in head-to-head leak down testing where the competing MLS gaskets regularly leak 8% and the ICS head gasket leaks less than 1% in the worst case. In addition, the gasket body of the ICS is one, solid piece of metal, not multiple layers. The one piece metal body and seal construction of the ICS head gasket traps combustion gases in the cylinder. The unique construction of the ICS prevents combustion pressure from escaping, whereas MLS gaskets allow combustion gases to migrate between the layers of the gasket in those cases where clamp load is relieved from cylinder head lifting under extreme combustion pressure. ICS head gaskets have no sealant on the combustion seal. Metal-to-metal combustion sealing is a subtle but important factor in high compression racing engines. An examination of MLS head gaskets prior to installation reveals that the flouroelastomer sealant coating covers the entire gasket body as well as the combustion seal area. Properly constructed MLS head gaskets have a more pronounced embossment at the combustion seal than at other areas of the gasket body where a less aggressive embossment will suffice for low pressure fluid sealing. Sealant coating around the bores has a tendency to scrub off the more aggressive embossment of the combustion seal the as seen in the lower photo. The result after a relatively short period of run time is a gasket that, in effect, is .002” thinner in the combustion seal area than the rest of the gasket body due to the loss of sealant coating on the combustion seal of the MLS head gasket. The loss of sealant coating on the combustion seal of MLS head gaskets is accelerated by, and is most detrimental in cases such as the small block Chevrolet where two exhaust valves are side by side causing a build up of heat in the center of the cylinder head. MLS gaskets can severely damage cylinder heads when combustion leaks occur due to the fact that stainless has a much higher melting point than aluminum. As seen in the accompanying photos, the cylinder heads were severely damaged by superheated combustion gases leaking between the bores, the head gaskets subsequently melted as well. The application in these photos is a small block Ford on nitrous. This was the result from the first outing after the customer was convinced to try the Com***c MLS gaskets after successfully using SCE copper head gaskets for several years prior. He is once again a satisfied SCE customer. Conversely, when combustion leaks do occur in the ICS, the conductive copper body dissipates heat quickly enough that the cylinder head is spared, or in extreme cases the softer copper gasket body becomes the sacrificial metal, once again saving the much more expensive cylinder head from costly damage. An area too often overlooked in planning for the addition of power enhancers such as Nitrous Oxide is the cylinder head gaskets that actually seal all the extra combustion pressure that will be developed. 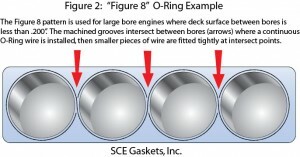 SCE Gaskets offers four “stages” of performance head gaskets for use in Nitrous Oxide applications. Solution 1: SCE Pro Seal composite head gaskets. These gaskets utilize a high density flexible graphite body mechanically “clinched” to a steel core, then wrapped with the industry's heaviest steel fire ring armor. This combination of base materials and methods of manufacture provide a gasket that is strong enough to seal a 50 to 100HP shot of nitrous while offering unsurpassed protection against heat damage. Solution 2: The ICS Titan with built in combustion seals and coolant seals provides out of the box killer performance with NO NEED for O-RINGS in the block or cylinder head(s). These head gaskets will dependably seal single stage and multi stage Nitrous systems in engines with 16 to 18 head bolts per cylinder head. For 10 head bolt applications with multi stage systems we recommend using the Titan or Pro Copper head gasket. Solution 3: SCE offers the Titan self sealing copper head gaskets with patented coolant sealing built in. Designed to work with engines that have O-rings in the block or head(s) SCE Titan self sealing copper head gaskets not only seal the largest multi stage Nitrous systems, they also assure leak-free coolant and oil sealing for dependable service in liquid cooled engines with O-rings. Solution 4: SCE Pro Copper solid copper head gaskets. These are the bad boys of drag racing. When used in conjunction with stainless steel O-rings and receiver grooves SCE Pro Copper gaskets will seal the biggest multi stage nitrous system you can fit between the fenders. Pro Copper head gaskets require the use of additional sealant in liquid cooled engines. As you can see, no matter what the level of performance you seek, SCE Gaskets offers products to make your bottle rocket as dependable as it is quick. It just requires a little planning. If you have any questions please call or contact us.